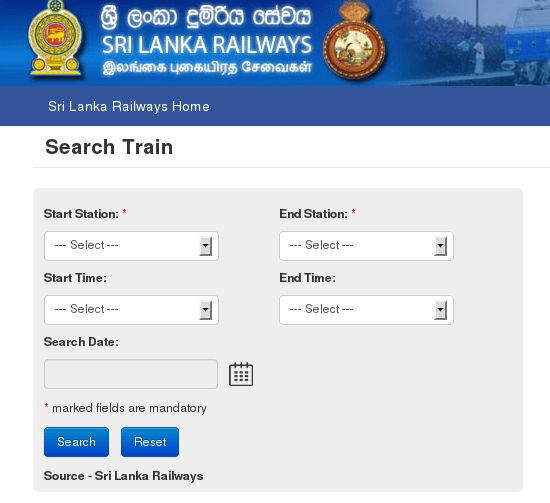 Sri Lanka Government Information Centre recently launched a Railway schedule application on their website. You can visit the website and check the train times from any railway station to any destination. You can select starting railway station and ending railway station to check the train times. You can also check trains on a specific time and date also using this website. Government Information Center website (http://www.gic.gov.lk/) provides official information on 1441 services provided by 209 Government Institutes in Sri Lanka. You can also obtain these information by their hotline telephone number 1919. This website is administered by Presidential Secretariat and ICTA (The Information and Communication Technology the apex body for IT in Sri Lanka).